I have a confession, the Super Bowl made me sad. It wasn’t who won. It wasn’t anything to do with the teams involved. Hell, it wasn’t even football related. It all had to do with a commercial. 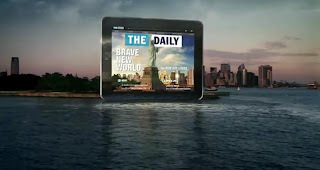 The commercial was for The Daily, a newspaper specifically created to be read on tablets like the IPad, While I do like sitting down with a newspaper, I get the majority of my news online, so I’d be a hypocrite if that was what was bothering me. It was actually the music they used in the commercial that brought me down. They used Joey Ramone’s version of “What a Wonderful World.” I was like three seconds into the commercial I recognized it. This is not a rant about them selling out or anything like that. In fact that exact version of the song has been used in Bowling for Columbine, Freaky Friday, and a Ratchet and Clank commercial. The reason the song brings me down, despite the fact that it is a beautiful version has more to do with the circumstances it was recorded under. The album Don’t Worry About Me was released in 2002, when it hit the stands Joey had already lost his seven year fight with lymphoma. It is a haunting album, listening to someone who was battling for their life sing songs like “What a Wonderful World,” “I Got Knocked Down (But I’ll Get Up),” and “Don’t Worry About Me” is a strange experience. Even though the album is full of optimistic songs, I still have a hard time listening to all of it in one sitting. Wrapping up, I don’t begrudge the Daily for using the song. Hearing it just reminds me that another of my musical heroes isn’t around anymore; that’s sad. This April will mark the 10 year anniversary of Joey’s death. I hadn’t even realized that until I started writing this. How depressing. RIP Dee Dee, Johnny, Joey. I was lucky enough to see the Ramones play three times before their break up. It was not enough.